A Fully Self Catering Accommodation. The Cottage is the perfect retreat for those seeking seclusion and independence. It has queen and twin single bedrooms, both with ensuite bathrooms. 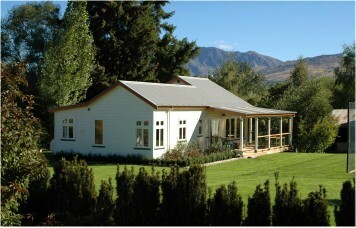 A historic farm house in a country setting just out of Queenstown. Relax in the king, Queen or Twin Apartments after a day of exploring the slopes of our Ski region. 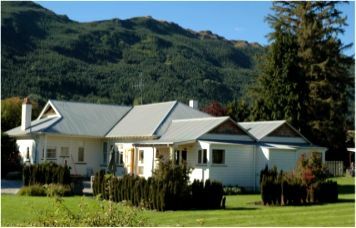 If Queenstown Country Accommodation in a peaceful, rural setting is what you seek, then look no further. Willowbrook’s spacious and modern, fully self-contained studio apartments are in an idyllic, rural setting below Coronet Peak Ski Resort in the heart of the beautiful Wakatipu Basin. Surrounded by majestic alpine scenery, Willowbrook Country Apartments accommodation is just 15 minutes from the bright lights of Queenstown and 5 minutes from the quaint and historical settlement of Arrowtown and The Hills golf course - home of the NZ Open Golf Championship. Award - winning Millbrook Resort is also close by (just 3 minutes' drive from our front gate) and we are within easy reach of all ski fields, wineries and some very picturesque golf courses. All apartments of course have free parking adjacent to the accommodation. Four acres of mature garden contain (among other things ...) a tennis court, a luxurious spa pool and some very friendly sheep. Willowbrook, close to Arrowtown is ideal for Ski accommodation being within easy reach of 5 ski fields, Coronet Peak, The Remarkables, Treble Cone, Cardrona and the Snow Farm. All our fully equipped holiday apartments have Sky TV, DVD players and free Wifi and there is a complimentary DVD library guests are welcome to borrow from. If you are coming to ski or snowboard, you’ll find your apartment lovely and warm in those colder winter months thanks to powerful gas heating. Ensuite bathrooms in our Queenstown accommodation all feature underfloor heating and large showers with unlimited gas hot water (the Queen Studio Apt and The Cottage also have bathtubs). Living areas are generously sized and have dining tables, chairs and sofas along with deluxe kitchenettes and plenty of fridge space. Sundecks come with barbecues and beautiful mountain views and laundry facilities are available for guests to use 8am to 8pm. As peaceful as the location of our Queenstown accommodation is, there is no shortage of restaurants. Arthurs Point is 7 minutes’ drive towards Queenstown; prestigious Millbrook Resort (boasting four restaurants) is three minutes drive and the quaint gold mining settlement of Arrowtown is only five minutes away. In the nearby Gold Town of Arrowtown on the banks of the Arrow River, dining options are plentiful with everything from a la carte dining to bar snacks and some very exciting and eclectic eateries. In your apartment at Willowbrook, you will find contact information and some sample menus. No problem if self-catering is your choice; your kitchenette has everything you need to prepare (and eat) a feast and there are directions to the nearest supermarkets inside your apartment. Willowbrook Country Apartments – look forward to seeing you! Willowbrook operates a NO SMOKING policy in all Apartments and Self Contained lodgings. Check in time: from 2.00pm. This cosmopolitan resort near the bottom of the South Island of New Zealand has it all. Thrill seekers can take their pick of adventure activities, while those seeking relaxation can chill out on one of several golf courses, in a vineyard, at a luxury spa or in the many shops, galleries, bars and restaurants. Indeed the surrounding Wakatipu Basin offers every conceivable form of outdoor activity, from bungy jumping to winery tours, from white water rafting to gold panning, not to mention of course, some of the most beautiful walks in the world. Follow the link for more ideas on activities in Queenstown. Alternatively, take in a part day in historic Arrowtown (5 minutes from Willowbrook) or soak up the magical Southern Lakes country scenery in Glenorchy and Paradise where scenes from Lord of the Rings and The Hobbit were filmed. 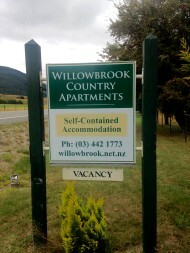 So for your next self contained country Cottage experience, come to Willowbrook in Queenstown.